Last fall, I upgraded my entire computer setup and with that upgrade I was also forced to replace the hard drives and RAID enclosures that I use to store and backup my images and motion content. 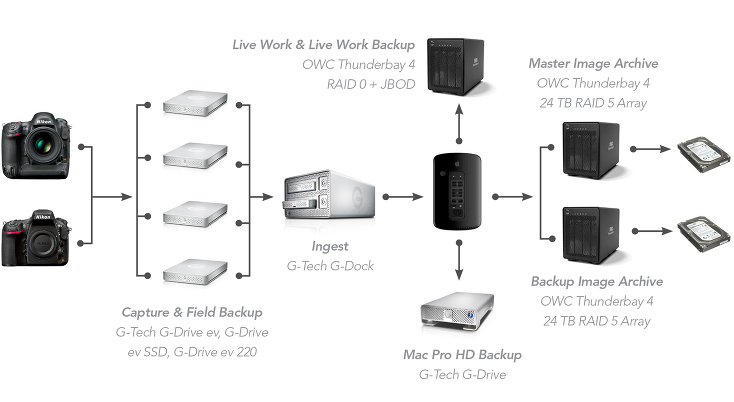 I realize a review of an external hard drive enclosure is not as exciting as a review of a new lens or camera, but for the pro photographer, having a fast, robust and well-thought out backup and storage system is paramount. Hence, when I upgraded my computer system, I set out to find the fastest and most reliable storage option available that could deal with huge image files and the 6K video footage produced by the RED Epic, which I use for motion projects..
Dave - Great article….love your photos and articles, but for someone to write such a detailed piece for amateurs is really outstanding. I thought I had allot of photos and data at 12TB, but 72TB……goodness. Thanks again, and I especially loved the article on the D810, great camera, great job.